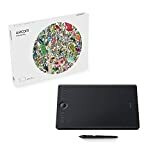 Wacom was founded in 1983 and in my opinion, whether you’re interested in painting, drawing or photograph retouching, it is the only company you should consider when looking for a graphics tablet. The Wacom Intuos Pro (the latest 2018/2019 version) is noticeably different to a few of the earlier models. I’ve owned several Wacom tablets and in this Wacom Intuos Pro review, I’ll briefly comment on previous models. There are a few Chinese companies that make something similar to the Wacom Intuos Pro but they aren’t as reliable. The word tablet has become synonymous with a touch-screen device; please don’t be confused as this is not a device with a screen–it is just a peripheral, much like a mouse. That said, Wacom do make a few models including screens. These are commonly referred to as their Cintiq devices but they also have a few portable options with built in computers, such as the Wacom Mobile Studio Pro. 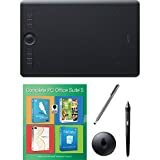 If your local computer store doesn’t have a Wacom tablet to try out, try a phone store. The Samsung Galaxy Note 8, Samsung Galaxy Note 9 and presumably the upcoming Samsung Galaxy Note 10 (or whatever it is called) use Wacom technology in their S-Pen. It’s not quite the same but it gives you a clue as to what to expect. The Wacom Intuos Pro tablet is well packaged in the box and includes a few gadgets you may or may not find useful. For example, the little silver ring on the pen can be changed to a different coloured pen–this is useful if you use multiple pens. There’s ample pen nibs with different properties to choose from as well. The default one is great and I’m probably not going to change pens as they’re quite expensive. That said, the spray brush pen would be useful in photoshop. In terms of its construction, the Wacom Intuos Pro tablet is a quite an upgrade from previous models; it’s made of carbon fibre along with aluminium. It feels very rugged, and the underside has two nice rubber stripes going along the tablet which will stop it slipping around on the desk. The edges are smooth and nothing feels cheaply made. There’s a button on the side to turn the tablet on and if you hold it for a while, you can activate the included Bluetooth-sync setup. I’ll talk more about the Wacom Intuos Pro wireless bluetooth features later. There’s a switch on the side to disable touch gestures. The touch feature works well, and it functions as a mouse if you want it to. I tend to only use it as a means to zoom into the canvas in Adobe Photoshop CC 2019. The buttons all have a nice feel, and they’re a substantial improvement to the Wacom Intuos 4 as well. They’re not all held under one piece of rubber, so you won’t experience cracking as per the previous models. The touch ring seems to be quite sensitive and it brings up a menu on screen. It’s really, really well designed. The USB type C port is a nice option for charging and I much prefer it to a built in cable, as per the Wacom Intuos 3. It’s also better than micro/mini USB, in my opinion. I’ve never forgotten my first impression with the first Wacom tablet I bought–it is a weird experience. Initially, you might feel a bit disconnected from the pen but this soon changes. Despite the fact the Wacom Intuos Pro tablet is advertised as being A5, it’s actually slightly bigger I believe and it’s slightly wider than previous models. If you’re like me and use a 16:10 screen, this won’t benefit you and make sure you force proportions in your options. If you use a wider screen, you’ll benefit from the extra width. It’s a nice size tablet to use. The larger, A4 model feels a bit more natural (natural isn’t always superior) as it’s closer to the size of my screen. With the smaller models, it’s rather like a gear on a bicycle only in reverse i.e. a small movement on the pad equals a huge movement on the screen. For drawing, I prefer to have more natural “gearing” so to speak. However, when you’re editing photographs, you don’t have to be quite as precise most of the time. There’s also a precise mode and it works extremely well. What happens is it restricts the amount of movement the mouse can do on the screen–by pressing one of the express keys or a button on the pen–this therefore makes the pen feel slower on the screen. You may find the medium–especially if you have a large screen–quite unnatural to start with and it might feel almost impossible to do accurate movements. You will soon learn with muscle memory and my advice here is to draw circles a few times each day. After a while, you’ll soon be used to it. I don’t believe one size is perfect necessarily but I believe the medium is the best option and I’ve had this fight with myself for a while. It’s definitely better for photography. The main benefit to a tablet when photograph retouching is not as obvious as you might think. The precise movements compared to a mouse are nice but actually being able to change pressure on the pen is equally as useful, especially if you are dodging and burning. The pen accuracy is good, and the sensitivity feels like an upgrade from the Wacom Intuos 3. It doesn’t feel much different to the Wacom Intuos 4. The pen nibs don’t seem to wear out as quickly as some models, and the stylus has an erase at the other end–this is common with Wacom but I’m mentioning it in case you’re unfamiliar. Here’s where my review gets a bit negative and perhaps somewhat complicated. A Bluetooth receiver is not included in the box and Bluetooth itself is an upgrade/downgrade from previous models, depending on how you look at it. The Wacom Intuos 4 Pro had a different–lower latency–wireless technology, and it was reasonable priced too. Bluetooth is included with numerous laptops and computers these days, so you might not need to plug in an additional USB dongle, unlike previous Wacom tablets. The Wacom Intuos 4 Pro also had a removable battery–this one does not. I tried several bluetooth dongles, they were all similarly priced, they all had good and bad reviews on Amazon and none of them functioned the same in terms of latency. The best I found was the Asus Bluetooth USB dongle. I haven’t had many connection issues but they have been reported. My advice is to use the cable where possible. In my opinion, the Wacom Intuos Pro bluetooth wireless setup is far from perfect–the range isn’t even great. To increase the range on mine, I got an Amazonbasics USB extension cable. You should get one of these if you’re plugged into a USB 3 port as USB 3 interfears with bluetooth somewhat. The battery life with wireless is great, so I have no complaints there. It’s just the latency. I do not notice any latency with the Wacom Intuos Pro in wired mode. The Wacom Intuos Pro software is very good–it’s improved since the Wacom Intuos 3 days. I don’t find too many bugs. You can set things like pressure sensitivity, have menus with sub-menus (useful for photoshop commands) pop up on screen and various options you’ll grow to love. They take a while to set up, so if I’m honest, I leave a lot of it preconfigured–the Wacom Intuos Pro software also has a configuration that works with Adobe Photoshop CC 2019 by default. I don’t like speaking about price much in reviews because I can’t possibly know what my readers earn. If your budget is limited, there’s the burning question as to whether that money could be saved to buy half a lens or a flash so to speak. If you do a lot of retouching, photography editing or even drawing, you should buy one, in my opinion. It’s a solid product with minimal problems. If you draw a lot, I would consider a Wacom Cintiq Pro 13. I do not think you’d benefit from a screen with photograph retouching, so I do not recommend getting the more expensive model if you’re only interested in photography.